The Game of Checkers is popular all over the world. A nice selection of Checker Sets is shown below. Links are provided to Amazon.com where you can find out more about these Checker sets, and if you like, purchase them. Scroll down to see all the Checker sets. Our basic version of a classic game. This board measures 1/2" thick, 15" square and has a clear finish. The checkers are blank on one side and engraved with a crown on the other. Start with the blank side up and when you are "kinged" flip the piece over to show the crown. When not playing the game the included pouch makes for handy storage. This is our most popular checkers set! It is cherished for its beautiful wood board that features recessed grooves for storing the red and black wood pieces. The fine quality and durability of this set will be enjoyed for generations. By the way, chess is an educational game that will positively impact children and teens for the rest of their life. 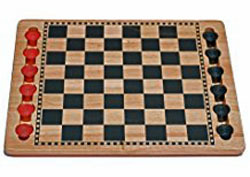 The game of French checkers, now popular all over the world, is known as Les Dames in France. As in many countries, this game has a history within the French culture. 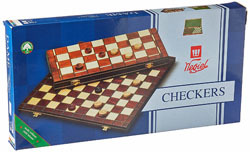 Play this simple and delightful game of checkers with this classic wooden set. 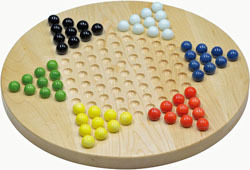 Play with all six players or just two on this traditional chinese checker board. Great as a coffee table game. Created from locally sourced hard maple wood. The board comes in a white gift box that is great for storage. Instructions are included as well as a storage pouch to keep the marbles together. The glass marble color shades may vary.